An unflinching documentary that peels back the layers to reveal the human being and the artist behind the cult of celebrity that is Lady Gaga. Gaga: Five Foot Two is the long-awaited, autobiographical documentary – produced by the star herself – shot in a cinema verite, diary-cam style. Lady Gaga has been a mega watt international presence for well over a decade, yet whose star seemed to be fading over the last five years due to a serious of personal setbacks and a nasty hip fracture, both of which have continued to take their toll on the artist’s meteoric career. She is currently receiving rave reviews and an Oscar buzz for her performance opposite Bradley Cooper in a highly acclaimed remake of A Star is Born, but at the time of this documentary’s shoot in 2017, the movie wasn’t even in production yet, and Gaga only remarks on it in passing, obviously delighted and intrigued by the challenge it would present. 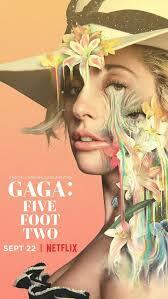 In Gaga: Five Feet Two we get the ‘portrait of the artist as a young woman’, pared down to practically no camouflages (of costume, hair or makeup), showing a highly vulnerable, empathic yet tough and resilient creature well aware of the crazy trajectory of her career path, as well as the toll it has taken on her private life and even her health (revealingly.) The film was made during the studio production of her groundbreaking album, Joanne, produced by the legendary Mark Ronson, whose work with Bruno Mars and the late, great Amy Winehouse says it all. The album and Gaga’s invitation to perform at the 2017 Super Bowl forms the narrative backbone of the documentary, with both productions shining a light on the inner struggles, turmoil, and creative energy that constitutes her life. Because she is, well, Gaga, there’s a certain amount of flamboyance to be expected, not to mention a degree of self-important philosophizing she luxuriates in, especially at the very beginning of the film. Take note that once she settles in to the cinema verite quality of the production, her navel-gazing is quickly replaced by something quite raw and real, and you then begin to understand the enormous heart-mind-talent that she embodies. Directed by Chris Moukarbel, Gaga: Five Feet Two is more than just a revealing look at a performer whose identity has been steeped in a self-mythologizing diva sensibility, to the point of deliberate caricature. The film is about raw talent, and the perils and pitfalls of fame on a private life. The producer, Mark Ronson himself presents a clear connection between Lady Gaga and that other incredible talent whose life ended tragically: Amy Winehouse. The parallels between the two singers are numerous, from their jazz influenced vocal styles (they both worked with Tony Bennet) to the cat eye makeup and turbulent love lives straight through to the diminutive girl-behind-the-legend vulnerability. But here’s the difference and the saving grace for Gaga. This film is also about Family, and that bond which provides shelter and salvation to a sensitive, artistic nature. It’s ever present in Five Foot Two, and sadly missing – especially in the role of father – for poor Amy. Gaga: Five Foot Two is presently streaming on Netflix.